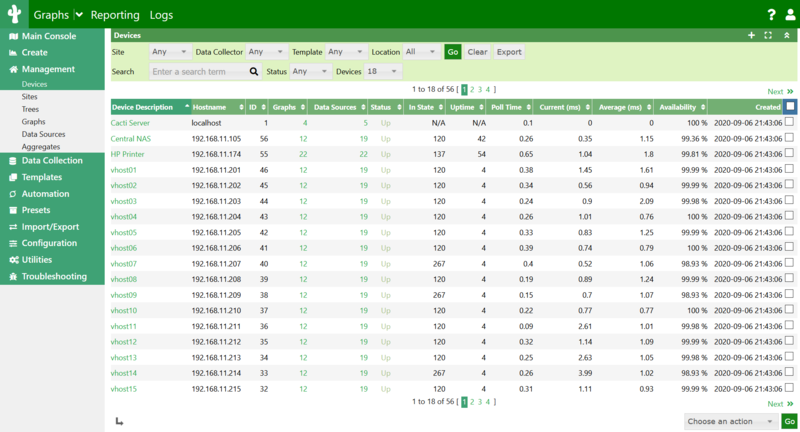 Cacti is a complete network graphing solution designed to harness the power of RRDTool's data storage and graphing functionality. Cacti provides a fast poller, advanced graph templating, multiple data acquisition methods, and user management features out of the box. All of this is wrapped in an intuitive, easy to use interface that makes sense for LAN-sized installations up to complex networks with thousands of devices. Get more details about Cacti. Do you need help? Are you having problems? Do you want to know what other users are doing with Cacti? Be sure to check out the Cacti discussion forums. With over 160,000 posts and 20,000 users, there is a good chance that your question has already been asked by another user. Use Google's index of the forum if you are searching for something in particular. Cacti is released under the GNU General Public License. Check out the announcement on the Forums.